The idea of this thread is to exchange ideas / experiences / tips re building and calibrating the Serge WAD pcb brought by CGS. Please note that Trimmer B (= TR3 in the old docs) is 10K, both other trimmers are 100K - this may not be marked on the pcb. when turning the delay pot... this high frequency tone seems to be the clock signal from the 4050 pin 12 - this ranges depending on the delay pot from 3.575kHz (max delay setting) to appr. 41kHz (min delay setting). Delay A even has a (weak) delayed(!) signal, Delay B out does not copy the signal (?!) yet ... the high frequency tone is on both outs. Since I only have a software scope and a (pretty good) DMM, I did the tests (only) partially / as good as I could before installing the SAD's. Learning so far: a real scope is highly recommended here (pin testing doesn't work well or at all with a soft scope for me). Will try to post soon but i'm too afraid to proceed as all i have is a Oscilloscope , no frequency generator ; and 'm not that good at using an Oscilloscope. Still not sure if my board just shows normal uncalibrated behavior or if something is wrong ... maybe I put the SADs back in today in reverse order to see if this changes anything. Regarding the seemingly wrong resistor values, I'm pretty sure you can't measure their "true" values when they've been soldered in? It all depends on parallel vs. series connection and such. I might be wrong though. You generally can't read resistor values in circuit. The rest of the circuitry acts as another resistor in parallel to it, making things read low. I finished mine right after the first run of PCBs arrived. At first it did basically nothing. I dont have a good scope unfortunately, and spent a couple days fiddling with the trimmers. After a long long time, suddenly from nowhere, like magic, it started working! THEN IT DIED. Plain and simple, went belly up. Honestly so heartbreaking and $pendy, I decided to wait until others were in the thick of it before digging back in. Maybe today is the day for that. Please excuse my non technical descriptions, its been several months on the shelf, and I have put it out of mind to spare my sanity. Just plugged it back in for a contemporary test. No output from A and B outs. Flanger out passes signal with CW and CCW acting as a gain control. 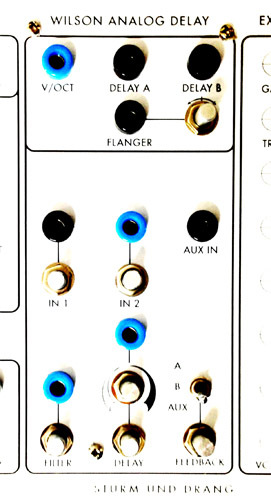 Flanger out is acting like a VCA using the delay CV as gain. Filter control works as it should. This module is tricky as hell. Follow the trimming instructions really really carefully and make sure the filter is wide open when you test it! The filter and delay control interacts, the more delay, the more filter you get. So if you have a high frequency signal and a long delay with much filter, there's a risk that the signal gets filtered out. So the unit might appear dead, but just isn't passing the signal due to control settings. I couldn't get a 5Vpp sine wave at pin 1 U3 with the current values. Changed the resistors in the input VCF section and got it working. The rest worked as expected - Except the 1V/Oct measuring. It seemed impossible to get -.190V on pin 1 of U3 with 12V at pad D.
Changed the resistors located around U1 fixed that problem though. The "sine" at pin 12 at u13 won't show up as a pure sine wave. If you have your scope set to like 50uS or something like that. You should see a pulse train where the top wiggles some. 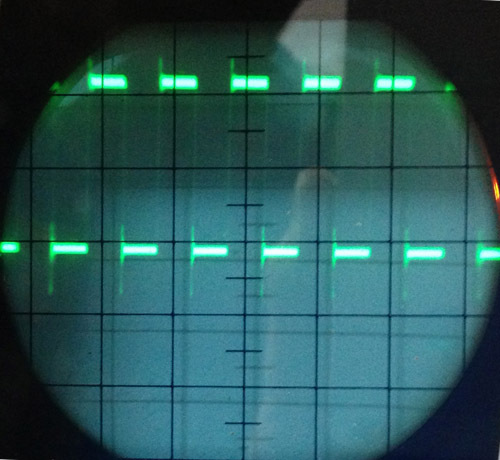 If you then adjust TR2 the top should start wiggling a lot - "Zoom" out, by setting the scope to something like 10mS or perhaps more (depend on the frequency of your sine) - and you should see the wiggly line becoming the sine. Note that it'll still have a second line beneath it, which is the base of the pulse. @op, what are the yellow caps? Tants? if so, why? zthee, how did you come up with those resistor changes - calculation / divine intuition / trial and error ??? Did you guys happen to notice that high frequency (clock/feedback) sound coming through A and B? This sound goes out of audio range when delay time is minimum and then goes down to 3.7kHz with max delay time (=4050 clock freq in my case). thetwlo, I used tants (as in the old BOM) and silver mica - wanted to go for some oldschool ... I'm not meticulous enough to test every resistor I put in but so far I've not run into any bad ones. They are all from Reichelt or Mouser, I believe most are Yatego. I haven't started on calibrating beyond the first stage. 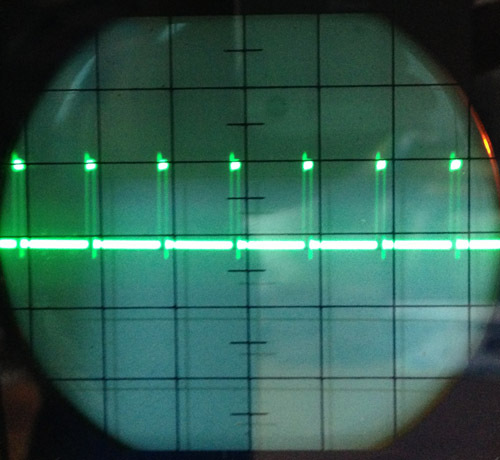 A bit afraid to with my poor oscilloscope skills. Jon , is yours running on 12V or 15V , i'm 15V here. What about others ? I had access to an old unit. So it was just a matter of cross checking every value and see what the differences were. It seems like the board Ken has was made to reduce the signal levels, perhaps to avoid distortion..
cleaninglady I run all my Serge stuff on Ã‚Â±12V. Do you think the resistor values will be the same for 15V if i need to change them ? There's probably a ton of resistors you'd need to change to get this running on 15V. That about the most depressing piece of news I've had all year. Is there any possibility you could do the sums for 15v ? I'm sure there are several Wigglers currently shxtting themselves over this news that would gladly pay you for your time. Myself included. I'm already well over $150 into this project and would really like to get it moving. 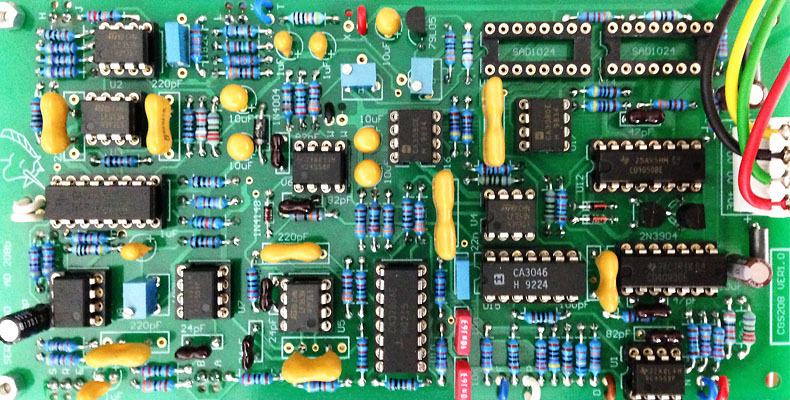 a pair of 78xx 79xx @ 12 volts will easily regulate a +/- 15 supply down to +/- 12 volts with a few additional parts. A bit of heat, but still probably a lot easier that calculating all the changes to many resistors, plus the chances of new errors being introduced. That was my solution to the WAD build. Sounds like a good idea ! Hopefully I can sort out how to do it on some perfboard. I may shoot you a message if needed. Today's findings: set my audio interface to 192kHz hoping the soft scope would yield better results - in particular for the VC clock tests - which helped a bit, not too much. It would be great if anyone could confirm their frequency range covered by the 4050 from min delay to max delay times - thanks! Noticed that in the older(?) docs U2 is shown as a 4558 while U1 is a TL082, i.e. exactly the other way around compared to the pcb markings (U1=4558, U2=LF353). Swapped 4558 and LF353 and the clock range went up a little to 3.9kHz to 43.6kHz. could you point me to any documentation of the WAD? schematics? Jon, thanks a lot for posting these values!!! By the way, Ken pointed out that R59 should be 2k2, not 22k (1k on the pcb). Added a second SAD1024, out B now behaves similarly.